The Umayyad city of Anjar was founded by the caliph Walid bin Abd El-Malik at the beginning of the 8th century AD. Situated at the foot of the Anti-Lebanon mountains, the site occupied a vital location during the period of the antique and medieval Bekaa: it sits at the intersection of the roads from Homs to Tiberias and from Beirut to Damascus. The current site constitutes the most complete Umayyad set, and witnessed the succession of civilisations in the region. 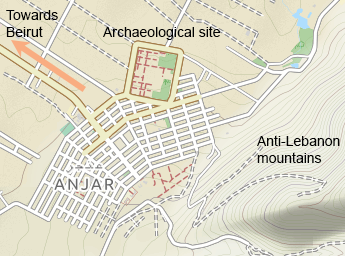 Anjar was built with a grid layout and measures 374m x 308m. Along the external enclosure there are 36 semi-circular towers and 4 corner towers. Two main streets run along the north-south and the east west axes (Cardo and Decumanus). In the centre there is a four column structure called Tetrapylon. 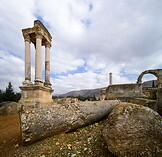 In the southwest of the Anjar site there are the ruins of a large palace, immediately adjacent to the ruins of a mosque. After the initial construction Anjar was redeveloped in later periods, between the 11th and 13th centuries AD. 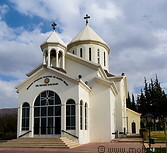 The adjacent modern city of Anjar was resettled in 1939 with several thousand Armenian refugees from Turkey. 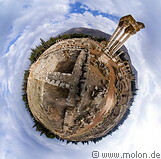 Anjar can be visited as a daytrip from Beirut (59km, 1:20 hours), either by car or bus. It has no own airport. It's possible to stay in Anjar (one hotel) or in the Bekaa valley for instance in Chtoura or Zahlé (or in Beirut and do a daytrip).